Nestled into a rugged hillside, gazing out over turquoise water that stretches as far as the eye can see, the Constance Lemuria Resort is a place of beauty and tranquility. With its fantastic facilities and five star service, you can simply relax and enjoy your holiday from the moment you arrive. Laid out in front of the hotel, you’ll find platinum white sands to sink your toes into while you enjoy a refreshing Piña Colada under the shade of a complementary parasol. Inside, the décor is effortlessly tasteful, with simple wood, marble and contemporary finishes. The rooms are spacious and boast spectacular sea views. And with four restaurants onsite, there is no shortage of incredible eateries either. Nature lover will enjoy this scenic spot teaming with wildlife. See herons, terrapins and Seychellois red fodies in the forest around the resort, as well as rainbow coloured fish in the surrounding Indian Ocean. And most special of all, the beach is a common spot for turtles to lay their eggs so you may even be lucky enough to see this magical event. 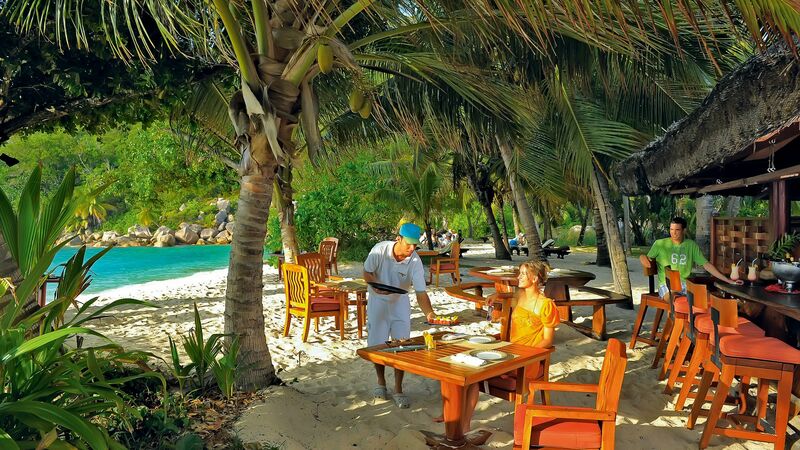 Savour a huge range of Seychellois inspired seafood delights just yards from the warm waves of the beach. 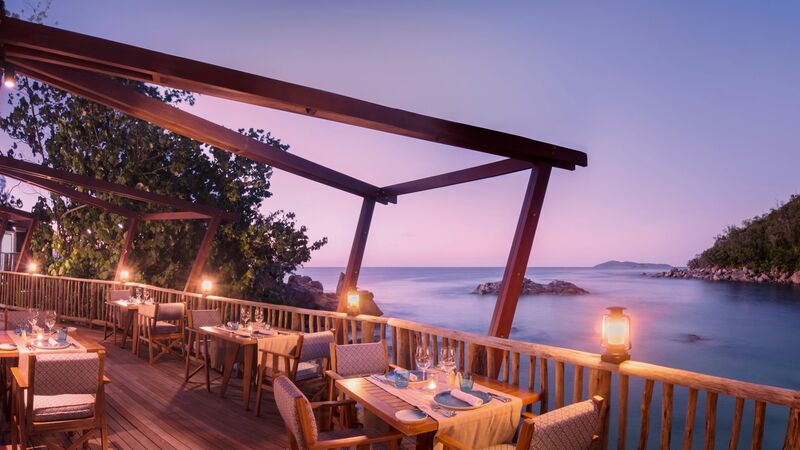 Enjoy the stunning sunsets of the Praslin coast with fine sand at your feet and a crisp, cool cocktail in your hand. 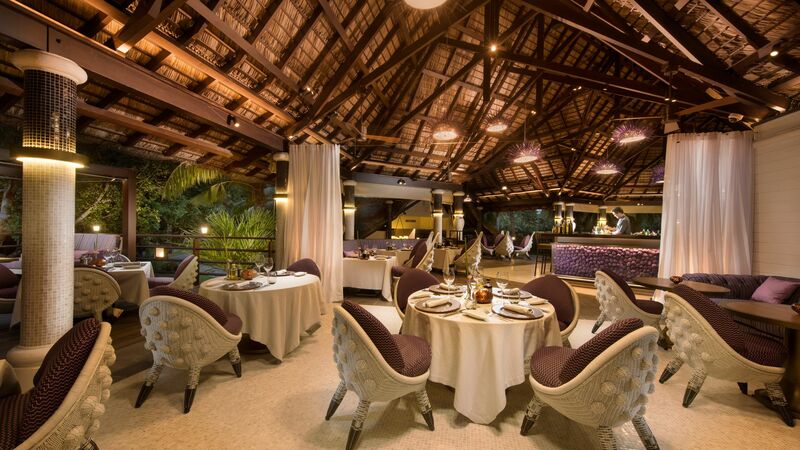 Diva offers a modern and chic dining experience. Encompassed in elegant décor designed by renowned French architect and interior designer Marc Hertrich, be prepared to be wowed by the stylish atmosphere. The food includes international and local options, as well as an extensive wine and whiskey collection. Go on an exciting culinary adventure every single night at this interesting restaurant which is fitted with theatre style kitchens. 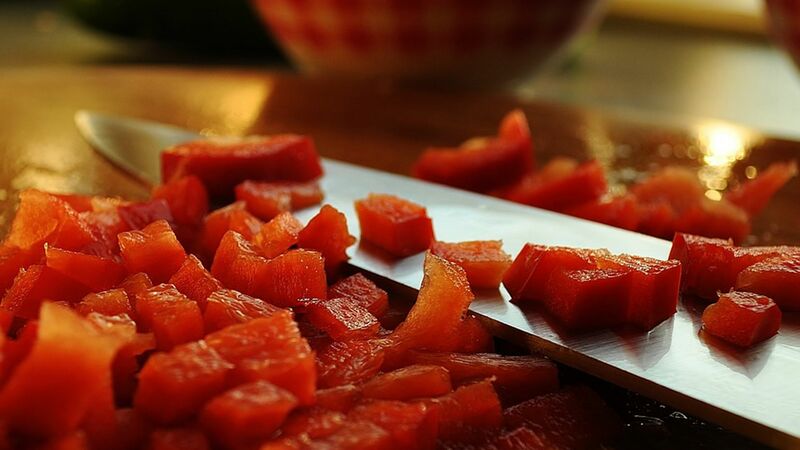 With à la carte and buffet options, served alongside the pool, The Legend has something for everyone and is not to be missed. Built into a rocky outcrop separating the two breath taking beaches, The Nest offers one of the most unique dining locations on the island. Yards from the water, the menu is seafood orientated with a creative Creole twist. There are three gorgeous beaches around the resort for those in need of some lounging time. Each of these - Anse Georgette, Grand Anse Kerlan and Petit Anse Kerlan - offer postcard perfect views, palm trees, the finest golden-white sands and luscious waves from the Indian Ocean. The hotel offers the choice of three immaculately landscaped swimming pools. Each features a unique tiered design, so you can enjoy incredible views out to the Indian Ocean and beyond. 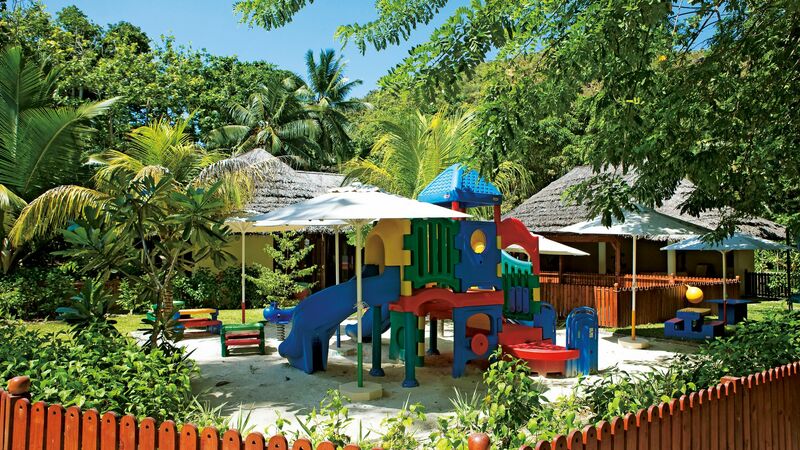 For peace of mind and some escape time, take advantage of the Kids’ Club available on site. Staffed with friendly professionals, this free service is a great way to entertain the little ones in a safe environment. Ages: 4 – 11 years. A babysitting service is offered at the hotel if you fancy enjoying a romantic evening at one of the fine dining establishments onsite. Relieve yourself from any stresses with a visit to the U Spa where you rest, relax and rejuvenate. 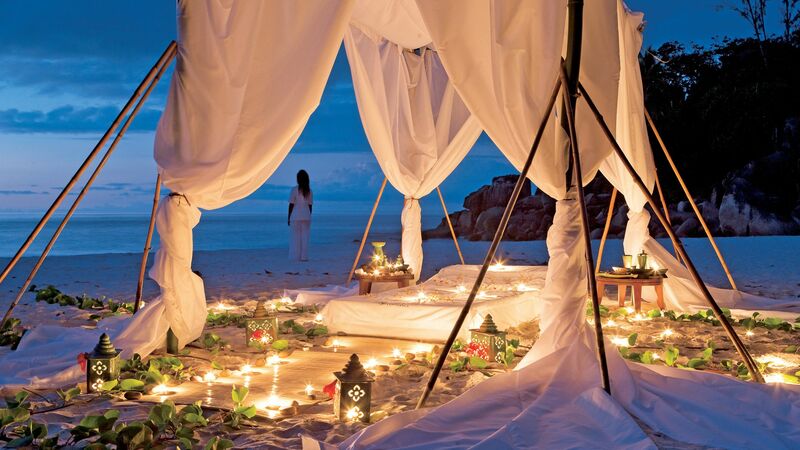 Indulge in unique healing treatments or tempting traditional massage therapies by skilled staff. There's also a sauna, steam room, Jacuzzi and plunge pool onsite so you can treat yourself to some extra me time. 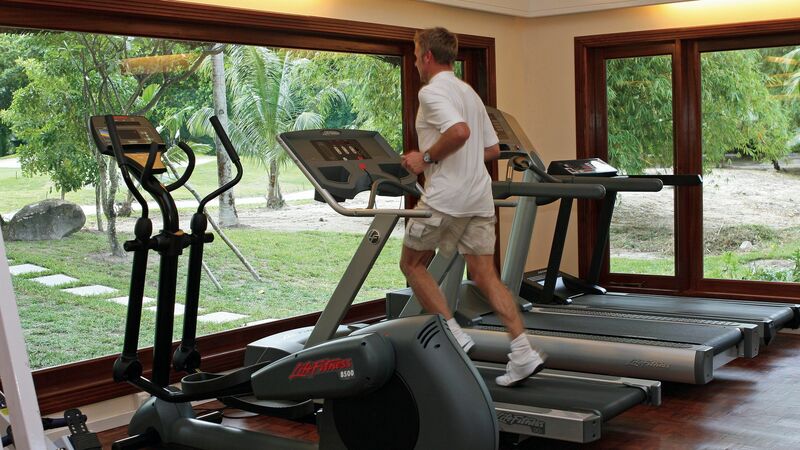 Overlooking the greenery and gardens of the hotel grounds, this top of the range gym contains the latest cardio equipment, resistance machines and free weights. 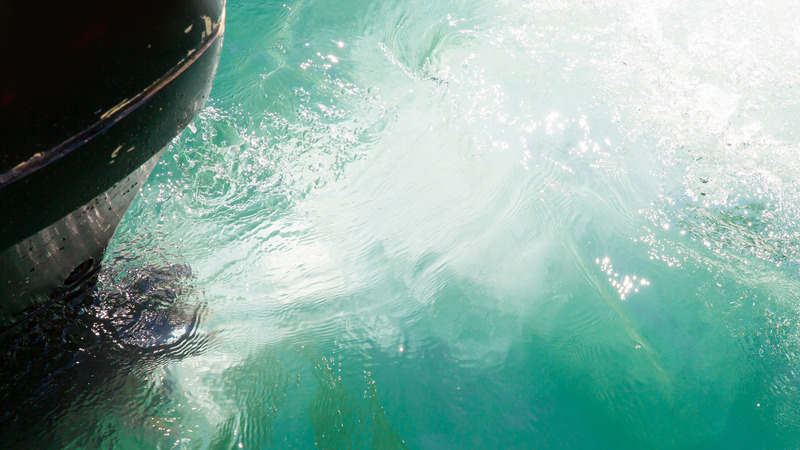 No visit to the Seychelles would be complete without an underwater adventure. The hotel offers onsite PADI certified scuba diving instructors so no matter your experience level you can join a trip to the deep where vibrant coral and marine life are in abundance. For more seasoned divers, there are some shipwreck sites nearby for you to explore too. 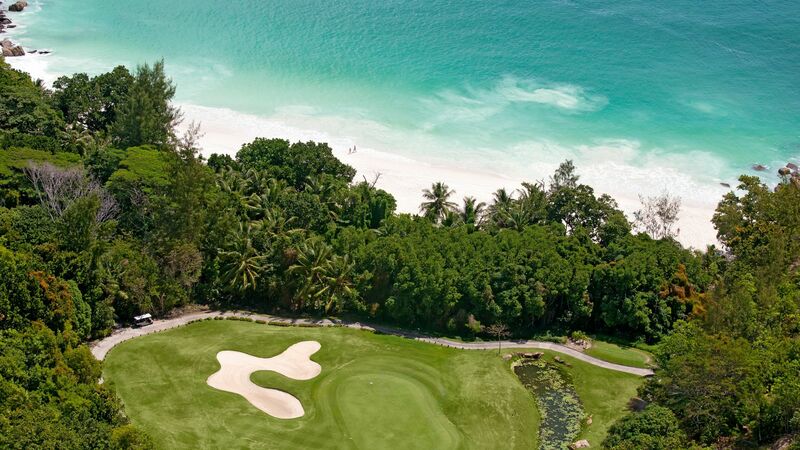 Boasting one of the few 18 hole golf courses in the Seychelles, Constance Lemuria is idea for those who hate the thought of leaving their clubs behind. Also hosting the MCB tour championship from 2018 to 2020, there is no better time to go for golf fans. There is a wide range of non motorised water sports, the most popular being stand-up paddle boarding, which complements the calm, crystal clear waters of the Indian Ocean perfectly. 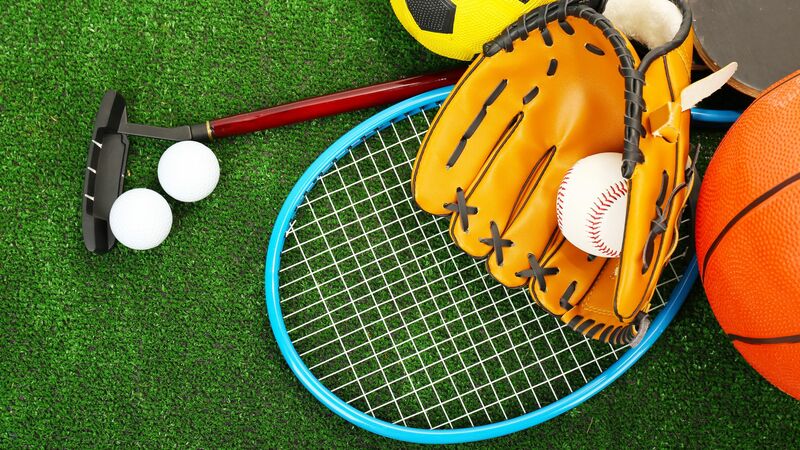 Tennis courts are also available onsite for those inclined to enjoy a friendly game or two before sunset. 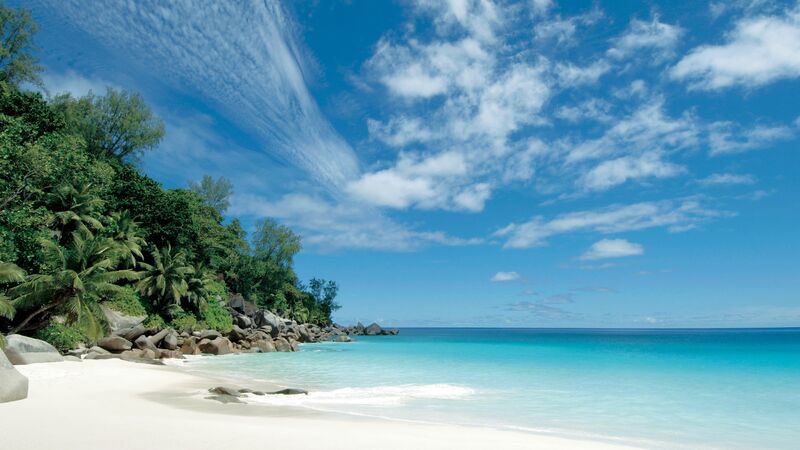 Constance Lemuria is set on the white sandy beaches of the spectacular Seychelles, and offers plenty of opportunities to relax. It’s located on the smaller island of Praslin, where you’ll find luscious jungles and rainforests filled with mango trees, banana trees, coconut palms and spice plants, all of which influence the delicious local cuisine. Trek through the interiors and admire the beautiful views as a guide teaches you about the local flora and fauna. If you prefer to head out to sea, there are boat trips and water sports available, as well as some excellent opportunities for snorkelling. Head underwater with scuba diving trips and see the colourful reefs, or the fascinating shipwrecks. Constance Lemuria is a 20 minute flight from Mahé International Airport followed by a 15 minute drive from Praslin Airport. Junior Suites measure 52m2 and are located just 15 metres from the shore and are stylied in a minimalist fashion with luxurious furniture such as a grand bed or private dining space. Air conditioning, tea and coffee facilities, minibar, satellite TV, tea and coffee facilities, minibar, Apple Mac mini, free Wi-fi, safe, telephone, hairdryer and 24-hour room service. Senior Suites measure 115m2 are palm-thatched luxury suites just 15 metres from the shore with a stunning contemporary interior.Your private lounge leads to an outdoor dining area and a personal massage pavilion, ideal for a couple. Facilities include air conditioning, tea and coffee facilities, minibar, satellite TV, tea and coffee facilities, minibar, Apple Mac mini, free Wi-fi, safe, telephone, hairdryer and 24-hour room service. 1 Bedroom Pool Villas are within a private garden with a private swimming pool and your own al fresco dining area. Facilities include air conditioning, tea and coffee facilities, minibar, satellite TV, tea and coffee facilities, minibar, Apple Mac mini, free Wi-fi, safe, telephone, hairdryer and 24-hour room service. 2 Bedroom Pool Villas are within a private garden with a private swimming pool and your own al fresco dining area. Facilities include air conditioning, tea and coffee facilities, minibar, satellite TV, tea and coffee facilities, minibar, Apple Mac mini, free Wi-fi, safe, telephone, hairdryer and 24-hour room service. Save up to 40% on the hotel price for holidays of 3 nights or more between 08 May - 13 July 2018, up to 35% between 09 April - 07 May 2018, 14 - 31 July 2018 and 24 August - 30 September 2018 or up to 30% between 01 November - 22 December 2017, 07 January - 08 April 2018 and 01 October - 22 November 2018 booked at least 45 days prior to departure. Our two bed room villa was great. Direct access to a beautiful beach. Our own little paradise. Good beds, great showers. The second 9 holes of the golf course are spectacular. The little beach behind the golf course is one of the most beautiful we have ever seen. we rented a boat for a day. also highly recommended. food was good but not great. Thank you, thank you and thank you to the whole team for making these amazing vacation and for making your hotel feel like we hope. Everyone of the staff has give us the best they can. Everyone so nice and so friendly. “ Amazing dinner at ?? ?The Nest??? Our dinner was an amazing experience - Delicious dishes, from mises-en-bouche to desserts, and wonderful service by Juliette and Ioana, who took care of every little detail to make sure we were delighted throughout our evening there. I stayed for one night at this hotel, though I arrived early before checked in, I was warmly welcome by the team and GM, great touch, We got comp breakfast which was great as we woke up early to catch the first boat and didn't had a breakfast. Once we got the room, we are delighted by the amenities thanks to all. Also, all our requests were quickly attended too..
Wow.....what can one say about this amazing resort from the moment you enter the gates to the resort where you are greeted by a warm welcome by the security guard and this continues throughout at the welcome reception to check in. A much appreciated cold towel and drink await you too! Everything is literally taken care for you and the Junior Suite had amazing views of the beach. Beaches are to die for as well as the Anse Georgette (although public is restricted due to the difficulty to reach it by land). My stay was unfortunately for 3 days and only visited The Nest Restaurant. My first ever introduction to Creole cuisine recommended to me by Martha was a brilliant recommendation. Excellent food (try the lobster and prawns) and a very good selection of wine. Sundowners were excellent with a perfect setting of the sunset. Special mention also has to go to Juliette at The Nest. The staff throughout the resort were excellent and with incredible memories to remember your name when greeting you. Not a golfer (yet) but the course looked amazing with a driving range to practice. Dive centre looked impressive with knowledgeable Dive Masters. My diving was to be off Mahe. A final mention to Sofia for making sure that my stay was perfect and that all my needs were met. 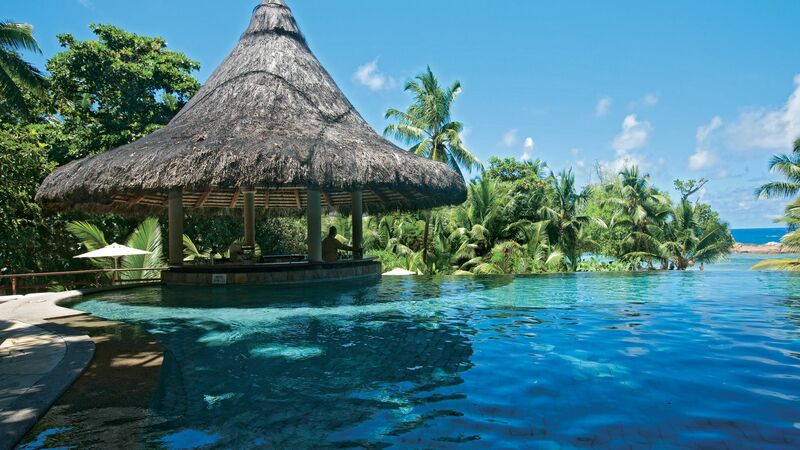 A perfect resort to relax and recharge the batteries after exploring the island and Le Digue and to set up for Mahe. Highly recommended! Thank you to all for making my stay thoroughly enjoyable.